The Blinky, Philadelphia Scientific's original watering monitor, revolutionized the checking of electrolyte levels in industrial batteries in the 1990s. It has a legendary reputation for reliability. The Blinky is a UL Classified electronic probe that senses the position of electrolyte in a cell. The probe length is available in mulitple pre-cut lengths or it can be easily cut to length by the installer. When the green light is flashing, the water level is OK. When the light is off, the battery needs to be watered. The operator can see that the battery needs water even from the other side of a dark battery room. He can see from a distance that the battery doesn’t need water, so he doesn’t waste time checking batteries that don’t need checking. The Blinky has a patented circuit that prevents false indication due to leakage paths and tracking on a dirty or wet battery. The Blinky battery watering monitor is fused in case of incorrect installation in the field. The Blinky battery watering monitor is a low cost solution for electrolyte monitoring. For more advanced options, please refer to the Smart Blinky above. Easy to see and to use: A flashing green light means the electrolyte level is OK; no light means it is time to water the cells. Protects your battery investment: The Blinky helps protect against battery dry-out, a major failure mode for industrial batteries. Fits almost all batteries: Blinkys are available with many standard probe lengths, and can also be easily trimmed to any custom length. Engineered to be tough: The Blinky is built to withstand the harsh environment of industrial battery applications. Its materials are resistant to corrosion and its low profile protects it against damage from battery cables and other hazards. It is designed to last for the life of the battery. 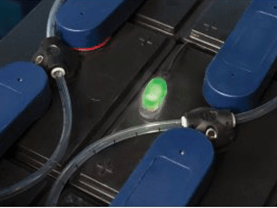 Inexpensive and cost effective: Over a battery's lifetime, the Blinky saves a surprising amount of time – or labor cost - and delivers a rapid return on investment. The cost of a single Blinky is a very small addition to the purchase price of an industrial battery; but it allows watering on a labor-saving "as-needed" basis. This is even more important with batteries that require less frequent water additions. UL Classified: The Blinky battery watering monitor is UL Classified so that you can be assured of its safety. Satisfaction guaranteed: the Blinky is covered by a one-year limited warranty.